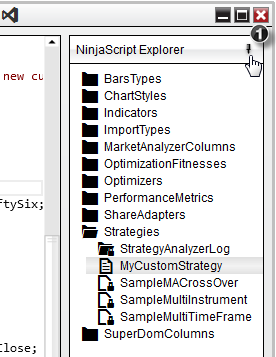 The NinjaScript Explorer provides a Folder view of all the supported NinjaScript categories that can be developed in NinjaTrader. 1. By default the NinjaScript Explorer will be "pinned" to the right side of the NinjaScript editor, however it can be collapsed out of view by pressing the pin icon located at the top right of the explorer window. 2. 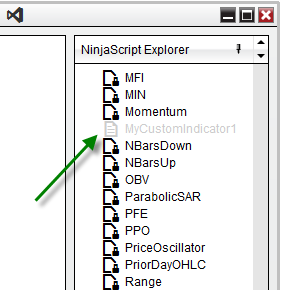 Once the NinjaScript Explorer is collapsed, you can quickly bring it back in view simply by selecting the NinjaTrader Explorer tab located on the right side. Selecting the pin icon again will re-pin the NinjaScript Explorer to the NinjaScript Editor. Right clicking on an individual folder or script will give you a number of different menu items to help with the management of your custom scripts. Opens the NinjaScript Wizard for the relevant object type. Right clicking on a NinjaScript category and selecting New... will open the NinjaScript wizard allowing you to create new custom scripts. Please see the Help Topic on the NinjaScript Wizard for more information. The NinjaScript Explorer gives you the flexibility to relocate and organize your custom scripts in a number of custom user defined folders. •To create a new folder, simply right click on the NinjaScript folder category you wish to organize, select New Folder, and use your keyboard to type a user defined name to identify the folder. Once you have created your new folder, using your mouse you can drag and drop any custom scripts of it's category under this folder. 1.You cannot relocate a locked system script. 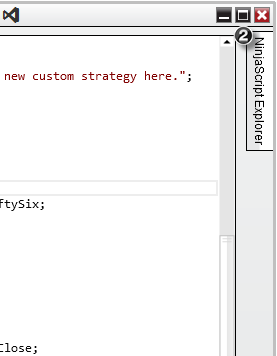 2.You can only relocate a custom script if it is closed from the NinjaScript Editor. 1. Right mouse click on the script from the NinjaScript explorer and select Rename. Renaming a script will automatically rename all relevant class names and all other required components. 1. You cannot rename a locked system script or folder. 2. You can only rename a custom script when it is closed. 3. You can only rename a folder if all of the scripts contained are closed. Removing a script will completely delete the script from your system. This action cannot be undone. 1. You cannot delete a locked system script or folder. When you create a folder in the NinjaScript Editor, it will also be created in the file system on your PC. 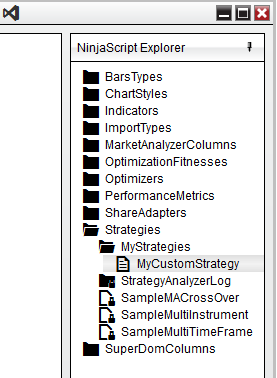 For example, if you were to create a sub-folder named "MyScripts" in the existing "Indicators" folder, a sub-folder would also be created in the Documents\NinjaTrader 8\bin\Custom\Indicators folder. 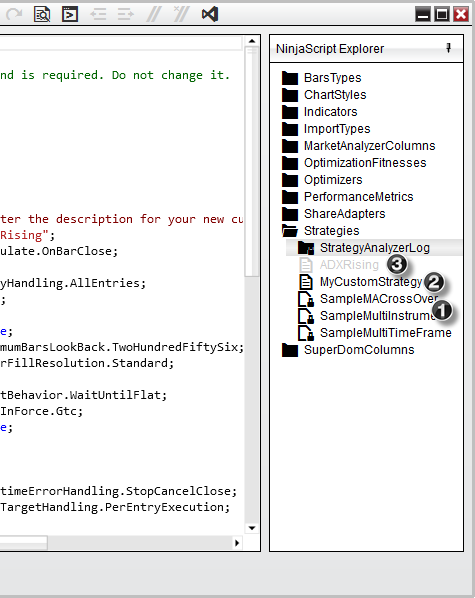 Once a sub-folder is created, scripts can be created or moved in that folder using the same processes outlined above. Warning: Changes to Sub-folders directly through the file system will NOT be reflected in the NinjaScript Editor. 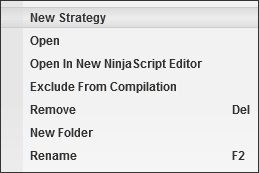 Creating and editing folders must be performed within the NinjaScript Editor. There may be situations where you have a custom script installed on your system that is preventing other scripts from compiling due to errors. The reason for this is that NinjaTrader will compile ALL custom NinjaScript files into a single DLL for performance reasons. If you find you have installed a script that is giving you errors that you cannot resolve, or you're currently in the middle of developing a script which is unable to compile, you can easily ignore these files from the compiler from the NinjaScript editor. When a script is ignored, it will be faded from the NinjaScript explorer to indicate that it will not be compiled.